If creating beautiful cakes for a variety of occasions is your dream job, then keep reading, because a career in baking and pastry arts may be just what you are looking for! Along with creating cakes, you will likely spend much of your time making other tasty treats, such as pastries, breads, cookies, or muffins. Obtaining your bachelor's degree in baking and pastry arts is sure to get you on the right career path that will lead to a fulfilling professional life. As with any other post-secondary degree, the first step is to complete your high school course work and obtain your diploma. Once you have selected the learning institution that you want to attend for your bachelor degree program, you will more than likely be required to submit a copy of your high school transcript, a copy of your ACT scores, and possibly letters of recommendation. It is important to note that due to the extensive, hands-on nature of this degree program, you will probably not be able to complete the course work in an online learning format. Another important factor to consider is that not all traditional colleges and universities offer a Bachelor's degree program in baking and pastry arts. However, if the learning institution you plan to attend does not offer this degree program, you should consider pursuing your degree in culinary arts with an emphasis in baking and pastry arts. The end result will be very similar for you. Furthermore, many private schools and culinary institutions offer degree programs that may also suit your academic needs. As you begin working towards your Bachelor's degree you will be required to complete classes that will teach you how to manage a kitchen, plan menus, and develop recipes. You may also learn about different types of desserts that you can prepare as well as specialized techniques, such as wedding cake decorating. As you learn to prepare foods like ice creams, chocolates, sweet breads, and tortes you will also be required to complete classes that focus on food production, food sanitation, and nutrition. As previously mentioned, the majority of this instruction will be delivered in a hands-on laboratory setting. Many schools offer their students the opportunity to select an area of focus for their studies. Common choices for this focus include: cost control, retail operations, business, human resources, kitchen management, and marketing. As you near graduation, you will likely be required to complete an internship. This will allow you the chance to put to practice the skills and knowledge you have been learning in the classroom. In addition, the fact that you have successfully completed an internship will look great on your resume to potential employers. The type of internship that you have the opportunity to complete will largely depend upon the college or university that you choose to attend. Once you have obtained your Bachelor's degree in baking and pastry arts you will be prepared to begin working in several capacities. Common employment choices are as a chef or manager at a large hotel, at a high end bakery, at a large resort, or at an upscale restaurant. - Develop your baking and pastry skills for employment. - Receive an education of critical thinking skills to assist you in your baking and pastry career. - Learn sustainability and menu development. 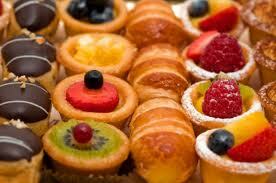 - Broaden your exposure to the areas of baking and pastry including cakes, chocolate and desserts. Without a doubt a bachelor’s degree in baking and pastry will make you more employable. Most programs will be 4 years in length however some offer other degree programs and concentrations which could be shorter. Ideally you want to find a campus near you but some schools do offer room and board. Online schools are really not a good option since everything needs to be hands-on. The first thing to look for is what areas of pastry and baking does the school cover. If you are interested in working only with chocolate or desserts then make sure the school extensively covers those areas. Often the school will give you the choice to select elective courses to round-out your curriculum based on your interest. The second thing to research is what placement or career help does the school offer after graduation. Many of the schools listed have been teaching students for years and have formed great relationships with companies that hire their graduates. No school can promise you a job however many have a proven track record of success that is worth taking advantage of. Talk to their Student Services department to find out more on how they can help. We have heard that some schools offer lifetime help to their alumni. The third thing to consider is the price of the overall degree. A Bachelor’s degree in general should run between $18,000-$35,000. As we always say it isn’t so much the price of the program but what you will learn during your training. If you can find a school on the lower end of that scale that offers what you want then we don’t see a reason to attend a more prestigious school only to have a big student loan upon graduation. If you do need assistance paying for your baking and pastry degree talk to the school first as they sometimes will offer scholarships that you don’t have to pay back. Taking out any federal financial aid loan (other than a Pell Grant) will need to be paid back. The forth area to talk about with the school is class size. Some schools won’t start a class until they have a certain number of students enrolled. You want a small class size to take advantage of the student to teacher ratio in order to get more personalized assistance. Your instructors should all be trained culinary arts or pastry chefs with a good resume and years of experience in the industry. The last thing to research with any school you are considering attending is what type of intern or externship they off their students. An internship is a great way to gain valuable hands-on experience. Some programs offer this as part of their curriculum and you can even get paid for the hours you put in. Find out first where the internship will take place to make sure it is a place you feel you can get good exposure and showcase your talents.